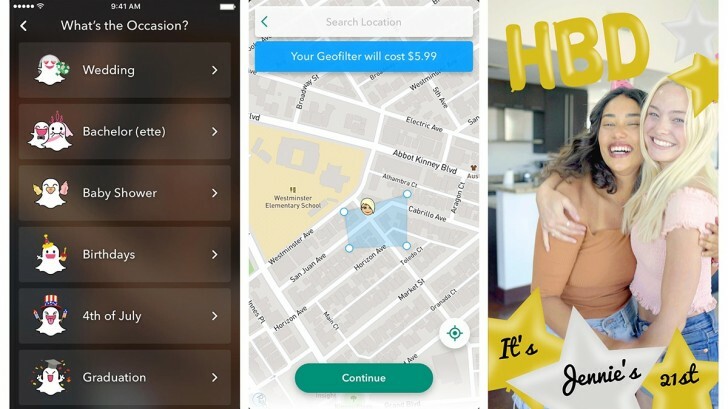 Snapchat announced the geofilters feature last year that allowed users to create a custom filter for a particular location that people in this location could use. This was useful for, say, a party; everyone attending that party could then use that location-exclusive filter for their snap. To make these filters, however, you would need to use Snapchat's web tool or image editing software. With the latest update, Snapchat has made it very easy to create a geofilter within the Snapchat app itself. Now you can choose from themes such as wedding, bachelor(ette), baby shower, birthday, graduation, and more. After selecting the location you want the filter to cover, just add some text, stickers and emoji and then submit it to Snapchat. It takes about a day to approve, then you're good to go. As before, geofilters are paid and start from $5.99 depending upon how long you choose to have the filter, with options ranging from an hour to up to 90 days. Why they selected the rich neighborhood of Oakwood, CA as example?